These fanciful woodland Toadstools are not only yummy but a delightful thing to see! Here's what the maker has to say about these sweet embellishment. Look what's pushed through the ground and into our kitchen! Our fanciful woodland Toadstools are full of surprises. We haven't caught any pixies or gnomes lurking about (as of yet), but we have discovered a chocolate center inside each enchanted dome! 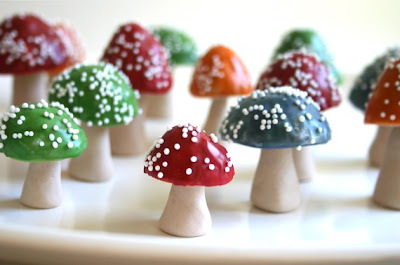 These edible Chocolate Filled Toadstools are the sweet embellishment every enchanted confection needs, made from fresh sugar paste, and artisan chocolate, and topped with a frosty cocoa infused glaze. And like all our decorations, are handmade in our California kitchen and are given meticulous attention to detail. This Listing is for 8 Toadstools of varying size ranging from 1" to 2" high and 3/4" to 1 1/2" wide. We've chosen dark red, green, blue and orange for the colors, but since each order is made fresh we're always open for suggestions.